Queryprojection not working Using springframework with hibernate JPA and querydsl. In AbstractJPAQuery at line 135 there is a check about query class name, this doesn't work if spring autoproxy is in use. The Hibernate dependencies are provided, so the class should also work without this dependency. Your fix doesn't work when the class isn't available. I just commited an improved instance check to SVN trunk, could you verify that it works for you? 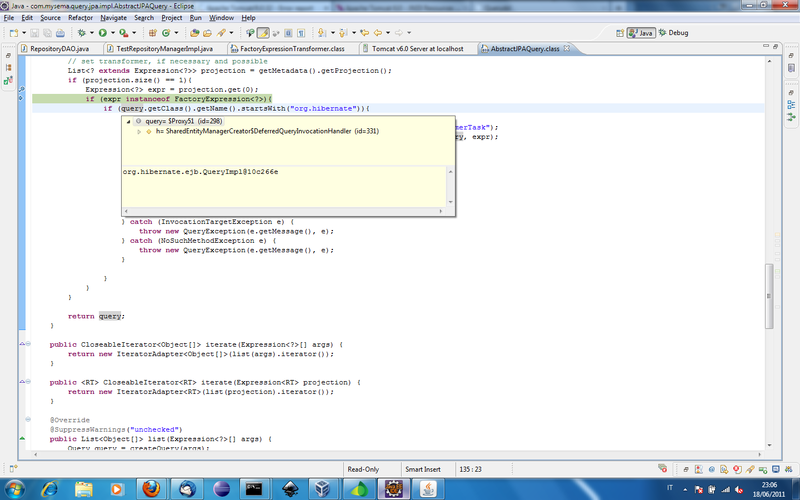 I have checkout 2.1.2 and copied AbstractJPAQuery.java file from trunk and it works! Any 2.1.3 release planned ? I will make the next release next week.